Romance and mystery surround America’s big silver dollars: The cowboy sliding one across the bar in the western movie, a shiny holiday gift from Grandpa, a magician pulling one from behind your ear. Collectors love these historic treasures both for their collectible value as well as their silver content. Silver has been a valuable commodity since its discovery thousands of years ago. Throughout our history it has been used in industry, decorative fashions and for coinage. The discovery of huge silver deposits in the Americas led to greatly expanded production. This precious metal is still extremely popular today for investors and collectors alike. The allure of any silver dollar is the combination of numismatic value and silver content in a portable and affordable format. If you own or are considering the purchase of U.S. silver dollars, you’ll need to know how much silver these impressive dollar coins contain. The 1878-1921 Morgan silver dollar series is the most collected of all classic U.S. silver dollars. These beloved coins were minted with silver discovered at the fabled Western lodes. The obverse (or front) of the coin shows Lady Liberty wearing a tiara. On the reverse (or back) is a magnificent American eagle with outstretched wings. Morgan silver dollars have 90% silver, 10% copper content. Each large 38mm (1 1/2 inches) Morgan dollar contains .77344 troy ounces of silver. A troy ounce is a unit of imperial measurement used in the present day to gauge the mass of precious metals. 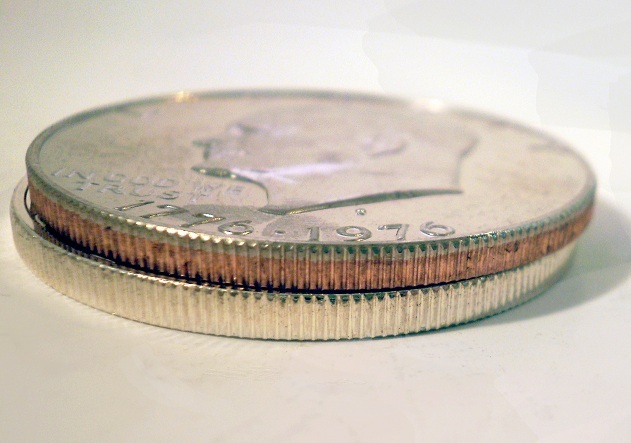 One troy ounce is equal to 1.097 ounces. The Peace dollar, minted from 1921 to 1935, was the last silver dollar issued for commerce. Liberty is shown with a radiant crown, reminiscent of the Statue of Liberty and an Eagle in profile clutching an olive branch graces the reverse. The Peace Dollar was first introduced after World War I. It came as a belated tribute to the peace treaty that occurred between the U.S. and Germany. Like Morgans, Peace dollars boast a 90% silver, 10% copper content. These coins are also the same size as the earlier dollar issue and features .77344 troy ounces of silver. The Eisenhower dollar series of 1971 to 1978 was intended to revive the tradition of large 38mm dollar coins in American commerce. Shown is a portrait of the beloved American General and 34th President, Dwight D. Eisenhower and the official Apollo 11 insignia of the American Eagle landing on the Moon. But because the price of silver was so high, only Ike dollars intended for collectors were minted with silver. Those coins feature a 40% silver composition over a copper-nickel base and contain .3161 ounces of silver. This silver composition over copper-nickel is referred to as “silver clad.” The large majority of Ike dollars were minted for commerce and are copper-nickel, containing no silver at all. One way to tell the difference between the silver clad and the copper-nickel clad coins is to look at the outside rim of the coin. The silver issues appear bright and clean. The copper-nickel coins will have a darker copper look on that outside rim (see photo below). Copper-Nickel clad on top, Silver clad on bottom. Copper-nickel clad has the darker copper coloring; the silver clad has the bright, clean coloring. Earlier U.S. Mint dollars from 1794 to 1885, such as the Seated Liberty and Trade dollar, also contain silver. Their silver content is similar to the classic Morgan and Peace dollars. Modern U.S. commemorative dollars are also 90% silver. These coins are issued yearly to honor a wide variety of people, places and events. Since the Eisenhower dollar series, all U.S. dollar coins for commerce have been smaller in size and have no silver content at all. The Susan B. Anthony, Sacagawea and Presidential dollars are all predominantly copper. Knowing the amount of silver in a coin can be helpful, but it’s important to keep in mind that precious metal content is not the only factor in determining a coin’s value. The initial mintage, the number remaining today and the current condition also must be taken into account. Some silver dollars that have been circulated heavily may not be worth much more than their silver content. Others may have great numismatic value that goes well beyond the precious metal content.